I would not hesitate to educate that person in a very blunt manner. That is very unfortunate for those poor fish. I hope she is doing daily water changes and that its temporary but that's probably far too optimistic. Yes, we can only hope that this is temporary. But she said they were previously in 30 gallons, which is STILL too small for 6 commons. I have a feeling she won't have 6 commons for long . . . .
Well I found the picture on Amazon. I didn't see any way I could lambaste the person. Very disappointed. Right under the teensy photo should be a "comment" icon. I can click it and comment, but due to Amazon's policies and etc I won't. Someone also needs to tell all these other people, too. You can't keep goldfish in a 3 gallon half moon tank and for the silly lady who claims the tank looks clean and so she hasn't had to change the water for several months, that regardless of what kind of fish you keep, you need to be changing water WAY more often than that! Just so much no going on here. Unfortunately there are many people out there who think 3g is a big place for a goldfish...they are so used to seeing them in those bowls. I know when I first got goldies I had a fantail, a tele and a shubunkin in a 5 gallon tank that was packed with gravel and ornaments and a mystery snail. Pretty Awful! Its terrible but until the bad information about goldfish can be replaced with the good accurate information once and for all its probably going to keep happening. Yeah most of the people at my school are like that and it annoys me but there is one teacher who is actually okay at goldfish care but I haven't talked to here about it as it just doesn't really seem appropriate. 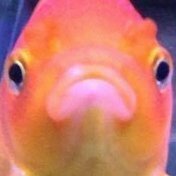 I was also doing a water change on one of my tanks and my brother was like the water is clean why are you doing a water change (facepalm) and he's good at science . You should comment on their comments too. All you can do is inform them or point them in a direction to do research themselves. That's true. But I mean even I didn't go the 3 gallon half moon tank or bowl route (though sadly we did do a bowl with a Betta and killed him in 5 months, which is why we got the half moon tank, but I actually hate the tank and my mom never got the heart to replace Red the Betta). 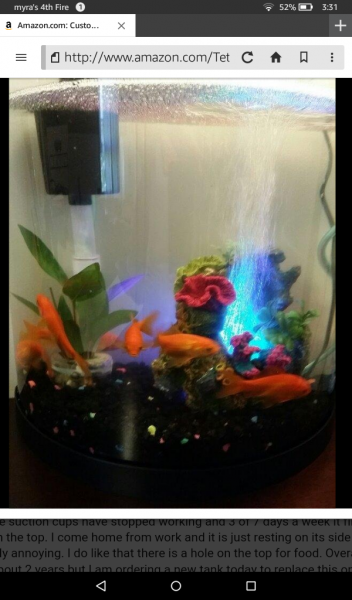 I did put two goldfish in a ten gallon tank, didn't cycle properly, and threw away filter media every two weeks. I did do ONE 50% water change per week, which honestly is probably the only thing that kept Slate and Rhonda alive long enough for me to learn. I'm lucky they are tough little Walmart thingies! It is pretty sad. There is a vast majority of people who are so set in their ways and think this is fine. I can tell you that working at a fish store and dealing with these types of people just make me want to throw in the towel sometimes. I try my best, but then they turn around and get angry with me for telling them these fish need more space as if it's my fault that they grow. On the flip side, there are those select few that welcome the "new" information I give them about goldfish and hopefully go and tell their friends what they learned that day. I can't get too frustrated, I guess. My first aquarium consisted of a ryukin and a black moor half his size in a 10 gallon with some god awful decor. We all learn, unfortunately it's mostly the hard way! 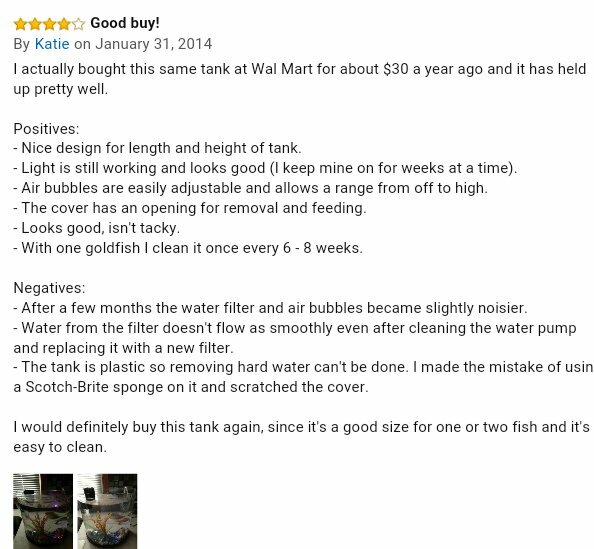 The best way to spread the right message about goldfish keeping is to leave quality reviews with your point embedded in it. Make sure to mention that you're buying the tank for a species that does ok in a nano tank, list approximately how quickly toxins (ammonia, nitrite, nitrate) build up in said tank with aforementioned stocking levels, and then mention how important it is to do research before buying a tank for your fish, giving the example that a common goldfish should have at least 20 gallons to itself. 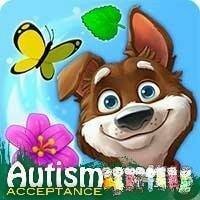 The more people that do this, the more people will see it. At the very least it might encourage some folks to start poking around the Internet for more information. I have that same three gallon tank and won't even use it for one of my bettas... It's a QT/show bowl for me. I feel so so sorry for those poor Fish.